Clean and wash mutton pieces with a spoon of vinegar. Wash rice and soak for 30 minutes in plain water. Add turmeric powder, salt, chilly powder, curd, garam masala, pepper powder and coriander powder. Add ¼ cup of water and Mix well then cook in a pressure cooker until 6-7 whistles or until the mutton pieces are tender. Later remove 1 cup of mutton stock and keep aside. This stock we are going to add in the rice while cooking. This stock gives a wonderful flavour to our biriyani. Now, fry cashew nuts, kismis and keep side. In the same oil fry half onion until golden brown. Now, lets prepare the mutton Masala. Chop onions,Tomatos. Grind ginger, garlic and green chillies. In a deep bottomed Kadai, add 2 table spoons of oil and throw in the sliced onions and saute until tender. Add in the ginger garlic paste and saute until the raw smell disappears. Then add chopped tomato and stir. When the mixture got smashed well, add mutton masala and Kashmiri chilly powder. Saute and mix well. Now add cooked mutton along with cilantro and mint leaves. 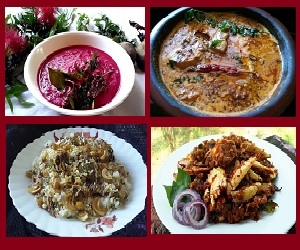 Mix well and cook for 5-10 mintues until all our masala gets the mutton flavour. Keep a lid on and switch off and set aside. Now, lets prepare the rice. In a deep bottomed kadai, add 2 table spoons of oil and throw in cinnamon, cloves, star anise, cardamom and bay leaf. Stir and add soaked rice and fry for some time. 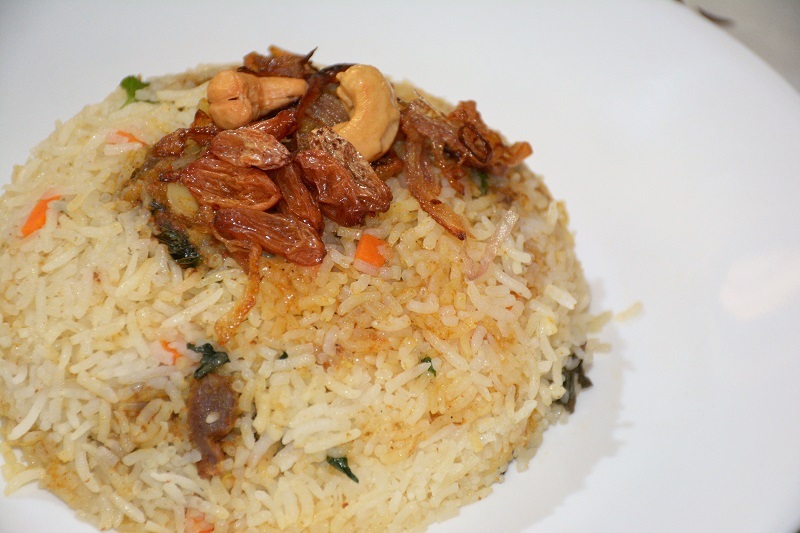 When the rice becomes crispy, add carrot chunks and 4 cups of water and 1 cup of mutton stock. Add salt and lime juice. Cover and cook. When its half cooked, add 1 tablespoon of ghee and mix well.. In this point, check salt and adjust it. Keep the lid back on and cook until its done. 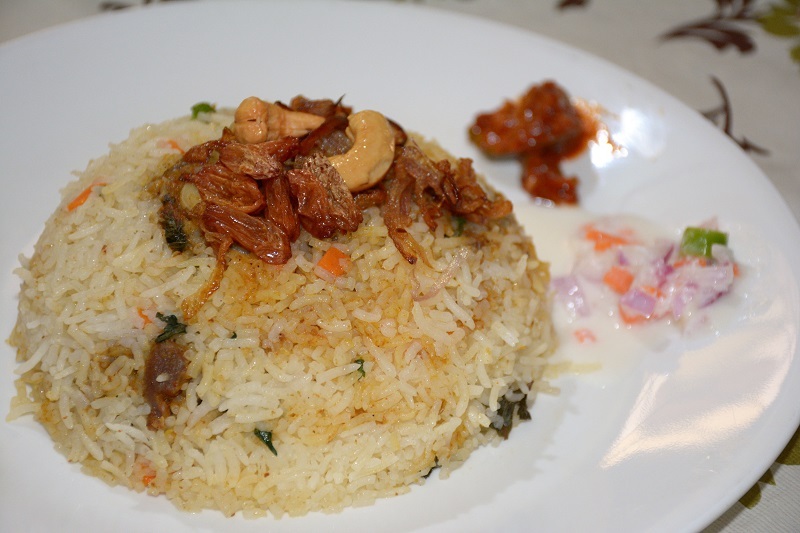 Now, it’s the time to set our biriyani. In a thick bottomed kadai, spread some rice, then add a few mutton pieces, cilantro and mint leaves, then a pinch of garam masala and again fill rice and then repeat the same steps until mutton pieces and rice gets over. Keep a lid on and cook for 10-15 minutes in a very low flame. 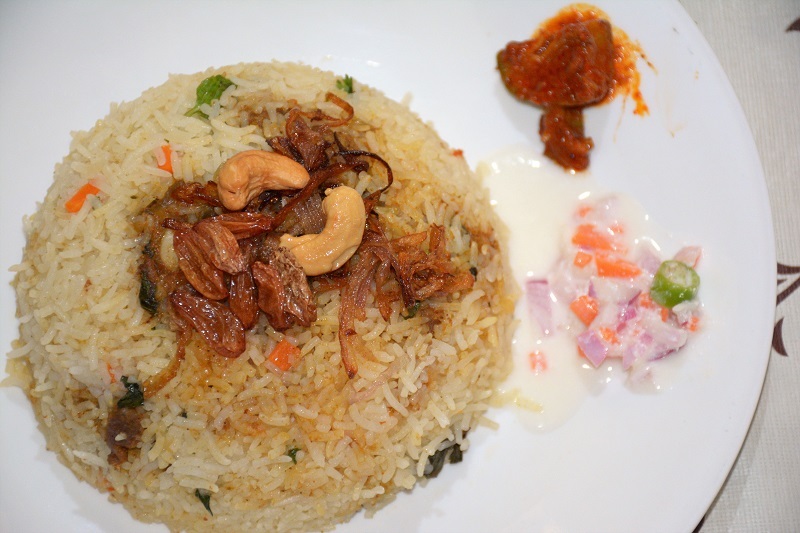 Mutton Biriyani is best enjoyed with a pot full of thick curd and some sweet pickle. Give it a try..